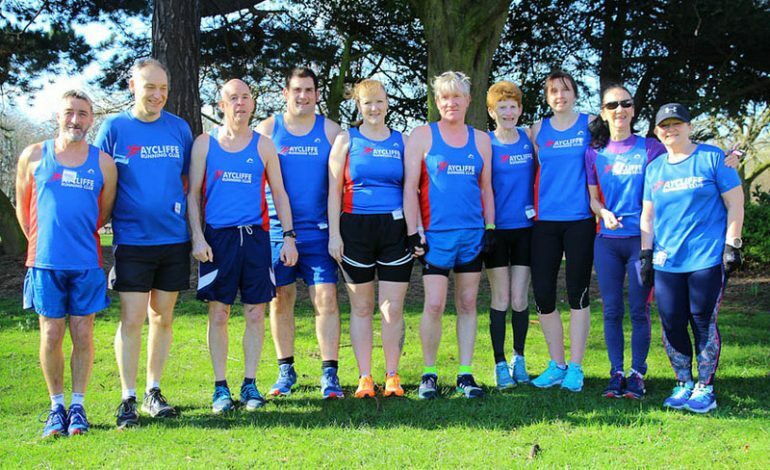 The focus in this weekend’s racing was the Dishforth Dash 10k and Ropner Park. 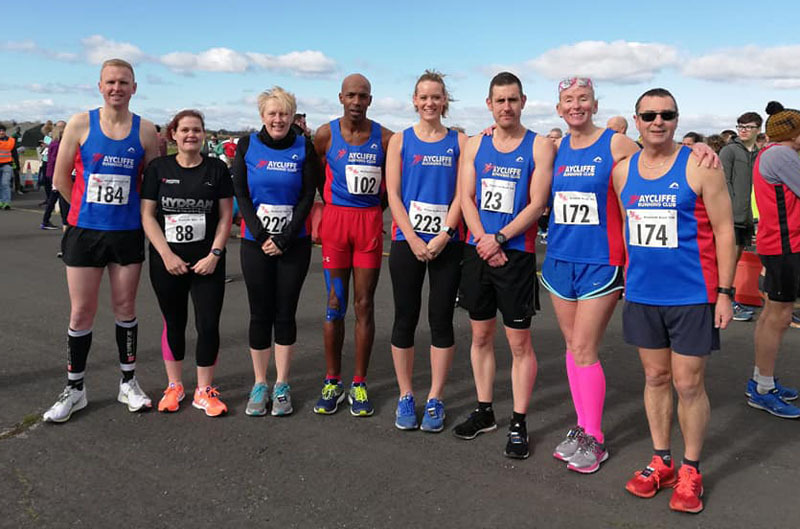 Dishforth Dash was in its second year and takes place on the unused Airfield at RAF DIshforth which means it is almost completely flat and a great venue for PB potential. It was a good turn out from the Club for this race (pictured below) and although dry there was strong wind which felt worse for being on an open airfield. That didn’t stop the runners however with most securing PB’s or bettering previous times on that course. First home for the club in 5th place overall was John Surtees in 35.34, he was followed immediately by Mark Wade in 35.57, Richard Campbell in 38.30, Floyd Jones 38.50 (also 1st in his age Category), Andy Talbot 40.08, Richard Holland 40.53, Angela Sutheran 47.21, Lindsey Brown 55.44, Denise Evans 56.43 and Gemma Holland 58.09. Elsewhere there was a good turnout of runners for the last race in the Tees Trail Winter Series. This 5k race took place at Ropner Park in Stockton. First home for ARC was Dave Blewitt in 22.06 followed by Michelle Jane 22.06, Peter Smith 22.57, John Burnside 23.13, John Richardson 24.28, Trish Kay 24.38, David Stothard 26.50, Jane Burnside 30.14, Yvonne Williams 30.19, Susan Clark 31.00, Sam Baronowski 32.52, Jan McLuckie 34.56 and Eve Doe 36.02. We also had two runners competing in longer distance races further down the Country. Richard Tonge took part in the Ashby 20mile race (near Leicester). Richard was very happy with him time of 3:52:42. In Kent, Simon Matthew Turner completed the Leeds Castle Ultra 22 mile race in 3:50.48. As always we also had people take part in the local parkruns on Saturday. There were two PB’s both achieved at Shildon by Husband and Wife, Tracey and Cliff Pickering. Tracey achieved a PB of 31.03 and Cliff 34.05. 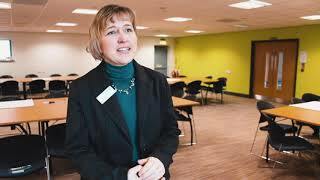 For anyone interested in joining the club, you can simply turn up at one of our sessions all of which start from the Oakleaf Complex in Newton Aycliffe. Monday night is beginners run at 6.30pm, Tuesday is endurance/speed session from 7pm, and Thursday is a track session and this takes place at Shildon Track. Further details can be found on our website or facebook pages or alternatively you can message the club via facebook for more information. With the end of the cross country season, the Junior running is now focused on Junior Parkrun and some local ‘fun runs’. 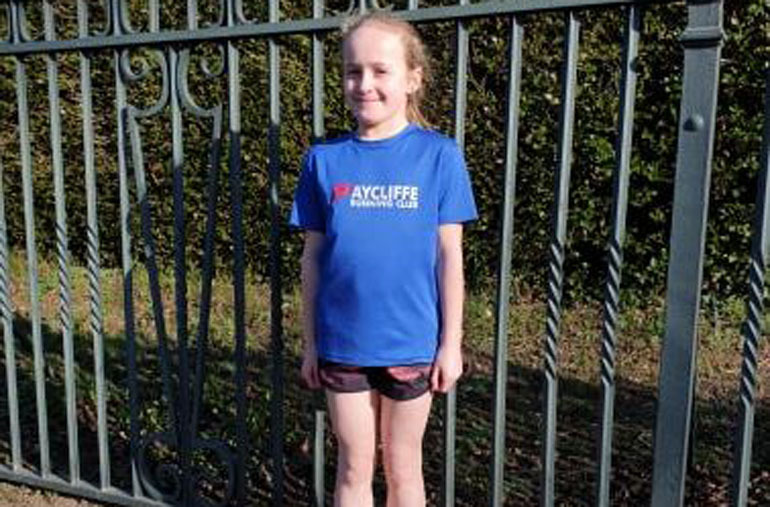 This weekend saw Felicity Lineton continue her good form and run a 35 second PB at Darlington’s Parkrun with a time of 9.40 for 2 kilometres. She placed 20th of 108 runners and was 7th girl home. The Aycliffe Junior Section train on Tuesday evenings at the Oakleaf Sports Complex.